Pictured from left to right: Charles Kemp, BCA Board Member; Robyn Ogilvie, Secretary, BCA; Michael Pratt, President, BCA; Colin Murphy, Head of Business Development (Americas), Global Ports Holding; Tameka Hanna, Vice President, BCA; John Michael Clarke, BCA Board Member; and Maya Nottage, Director of Communications, Blue Orchid Advertising & Public Relations. 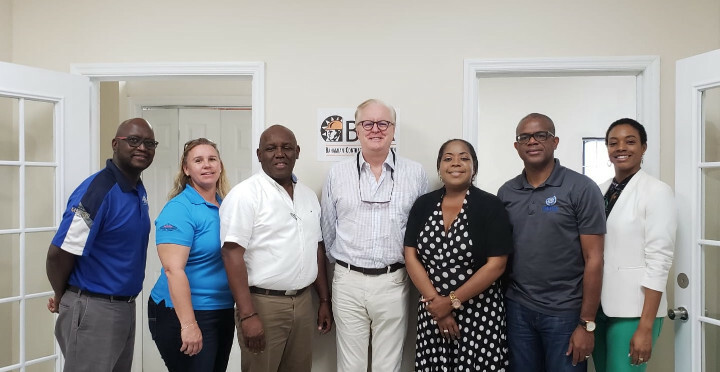 Nassau, Bahamas - The Bahamain Contractor's Association (BCA) was honored to receive representatives of Global Ports Holding as they recently made an official visit to meet BCA board members. The group discussed potential opportunities for BCA members to participate in the redevelopment of Prince George Wharf. Global Ports Holding executive, Colin Murphy, reinforced the company's commitment to collaborating with local stakeholders like the BCA in recognition of level of professionalism and expertise among its members, as was emphasized by Michael Pratt, President of the BCA, and others present. The BCA looks forward to working with Global Ports Holding and is pleased to mark the beginning of what we anticipate will be a strong and positive partnership.